Page revised in August 2017. The present condition of the ruins of Uthina proves it to have been a place of very considerable importance; they cover an area of several miles, and it must certainly have contained a very large population. From 1895 Murray Handbook for travellers in Algeria and Tunisia. 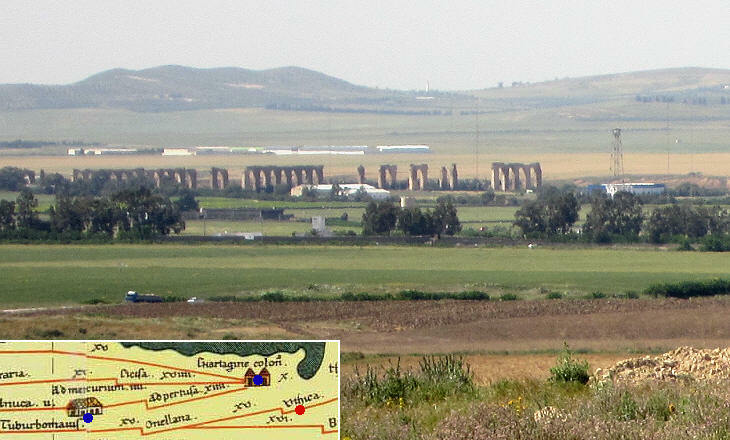 Mirage is a word which one easily associates with Africa and I thought of a mirage when in April 2012 I saw some large broken columns on a high podium at a great distance beyond the ruins of an ancient aqueduct, while returning by train to Tunis from Thuburbo Majus. My Italian guidebook gave the following description of Uthina, the only ancient town in the area: The ruins are imposing, but difficult to identify. One sees the foundations of towers of a Byzantine fortress and remains of cisterns, baths and of an amphitheatre, without making any references to a large temple. 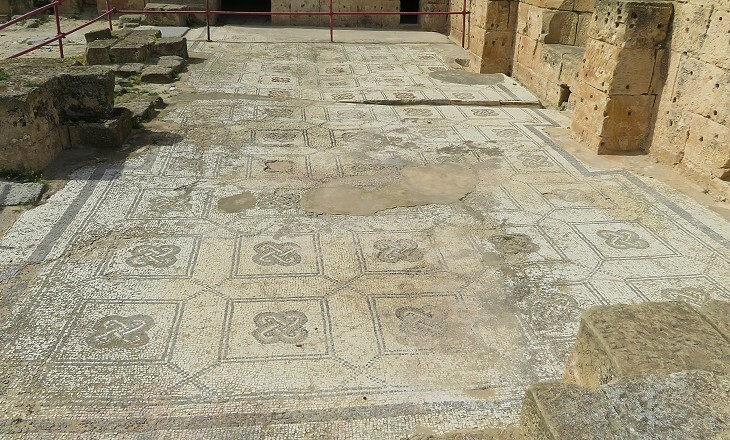 Until a couple of years ago visitors to Uthina would have only seen the foundations of a Byzantine fortress built on the site of the forum of the town, where presumably a Capitolium stood. The central and highest point in the city was crowned by a Citadel covering an area of about 60 metres long and 30 wide. The entrance-gate was on the N.W. front, facing the amphitheatre. The walls were of great thickness and constructed of large blocks of cut stone. The upper terrace was surrounded by a parapet; below were several chambers with strong vaulted roofs, still nearly entire. From 1895 Murray Handbook mainly based on an 1862 book by Victor Guerin - Voyage archéologique dans la Règence de Tunis. 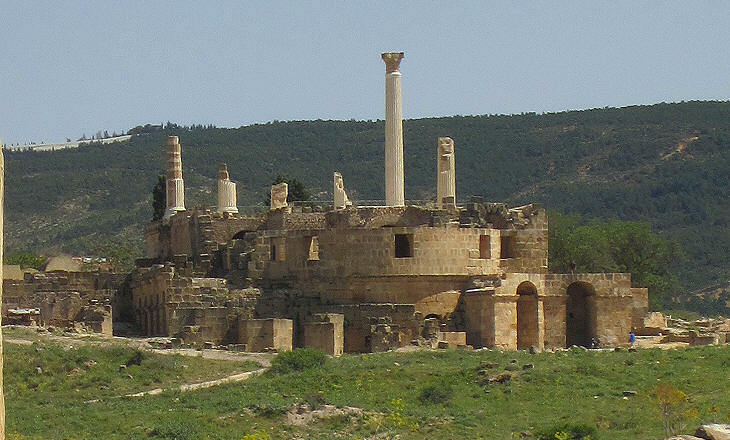 Jean-Baptiste Evariste Charles Pricot de Sainte-Marie, a French diplomat, carried out excavations at Uthina in 1873-1876, before the establishment in 1881 of the French Protectorate over Tunisia. Some of his findings were donated to the Museum of Algiers, a town which the French had conquered in 1830. 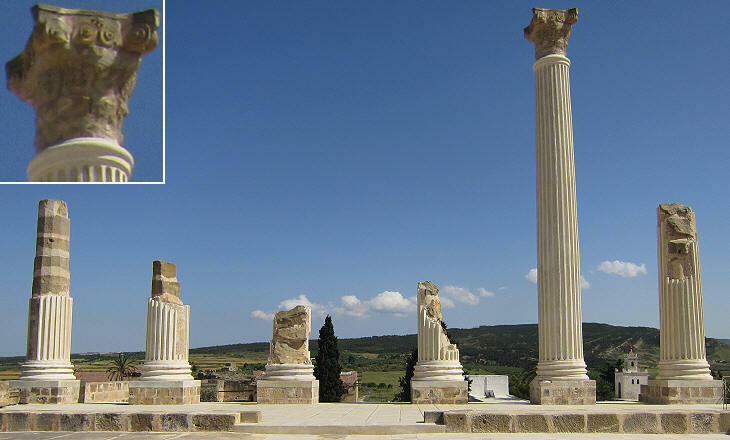 The amazing thing about the archaeological area of Uthina is that taking photographs of its ancient monuments is prohibited with the exception of the modern Capitolium and of the restored amphitheatre. 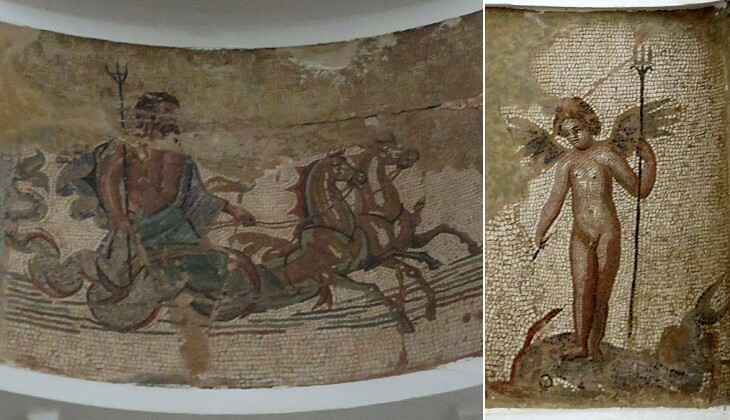 It is not a matter of copyright because Tunisian authorities allow taking pictures even inside museums as long as an additional fee is paid. The placards resemble those which forbid taking photos of military facilities. 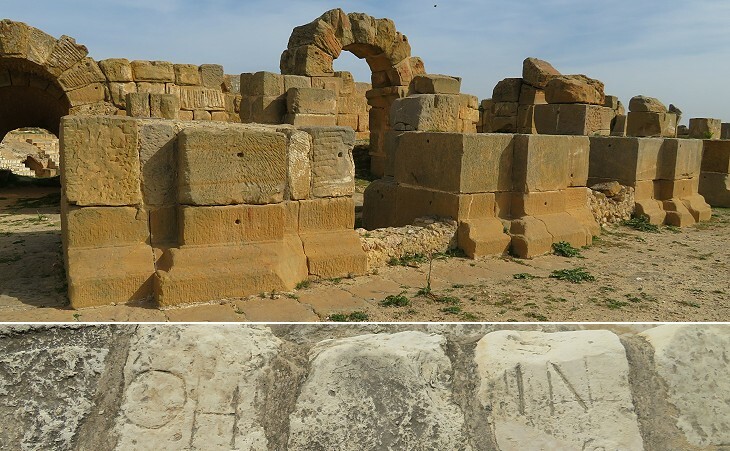 I wondered about the reasons for such a prohibition and I had the feeling that Tunisian authorities in charge of making Uthina a prime tourist attraction, do not want the state of the ruins before their intervention to be documented. Anastylosis (same stones) is the name used by archaeologists to indicate the reconstruction of monuments by using columns, lintels and other materials found in the immediate vicinity and which presumably were part of them. The word hardly applies to the columns of the Capitolium, a temple dedicated to Jupiter, Juno and Minerva, the deities which were worshipped on the Capitolium hill in Rome. One of the most challenging tasks for archaeologists is not to damage memories of the past by their own work. This poses a lot of restrictions of the use of modern equipment. In general when debris materials need to be carried away a short rail track is built to move carts without occupying much space. At Uthina one does not feel this concern has been paramount, because a large road leads right to the Capitolium across the archaeological area. The website of the Tunisian Agency for Heritage Development and Cultural Promotion is rather explicit on the objective of the changes occurring at Uthina: Now that the site of Oudna has been designated an archaeological park it is being equipped with the necessary infrastructure to turn it into a true tourist centre: a waymarked circuit, proper signposting, a site museum, a visitor’s centre, a shop. The website is silent on discoveries and on the panel of archaeologists supervising works. 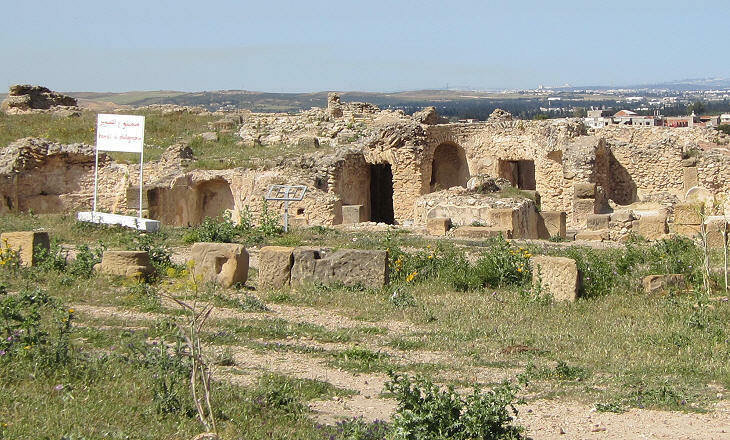 Tunisia has some very interesting archaeological sites; of these Thugga is the most beautiful one because it is not contaminated by a neighbouring modern town. Other archaeological sites are in bad need of better maintenance and they lack basic facilities such as a local museum. Then why is so much money poured on Uthina? The answer lies in its location. Thugga and the other archaeological sites (with the exception of Thysdrus) are far from the coast and its tourist resorts. Uthina instead can be reached in half an hour from Tunis or from the beaches of Hammamet, the first tourist destination in Tunisia. 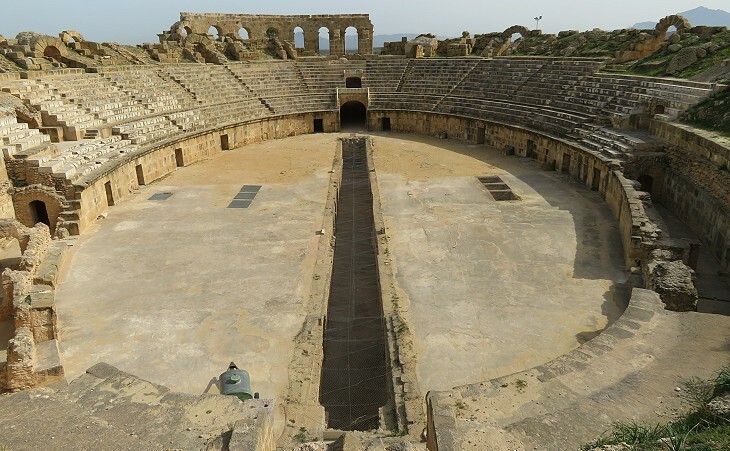 (..) is a very perfect Amphitheatre, with an elliptical arena; the major axis is about 70 metres in length, and the minor one 50. Four principal entrances led into it, and these, together with many of the upper arches, are still in a tolerably perfect condition. No doubt, in the construction of this, advantage was taken of a natural depression on the top of a mamelon (a dome shaped elevation) in which it is sunk. From 1895 Murray Handbook. What takes place at Uthina has happened and will happen elsewhere as long as archaeological sites are regarded as oil fields to be exploited. In a way UNESCO (the United Nations Educational, Scientific and Cultural Organization) favours this exploitation by including some sites in the World Heritage List (external link). This acknowledgement is sought after by member states because it adds to the tourist market value of their country. Eventually it might damage the sites because of an excessive number of visitors and of the construction of too many facilities. 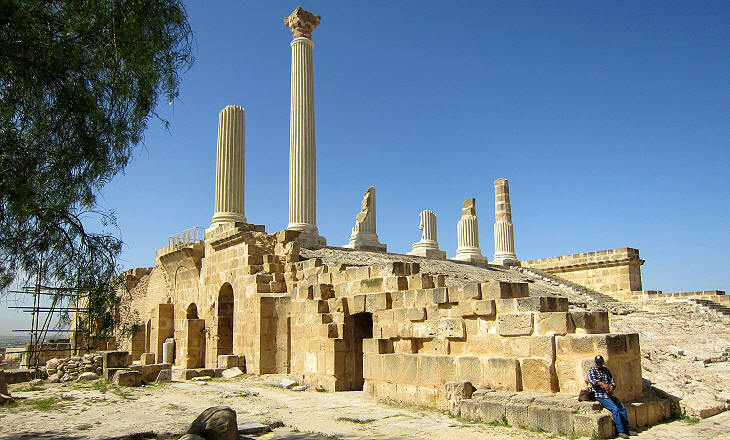 UNESCO executives ought to think of different means to protect the world's cultural heritage.